This is by far The Best Collagen for skin, cellulite, joints, hair, and nails, I’ve found! You may have heard me mention my back injury a few times… About 5 years ago – when I was in the BEST shape of my life – when a guy ran a red light, t-boned, and totaled my car. When that happened, L4 (low back) and C3 (upper back) became partially herniated. The pain was manageable and I could deal with it. Fast forward to about 2 months ago… my lower back pain got much worse. After weeks of suffering, I had an MRI done and learned that L3, L4, and L5 had herniated, too. My doctors keep using the word “surgery” but I’ve decided to exhaust every single non-surgical option possible before I go down that road. The very first thing I did after I saw my MRI results, was that I started taking triple-daily doses of Collagen Peptides. 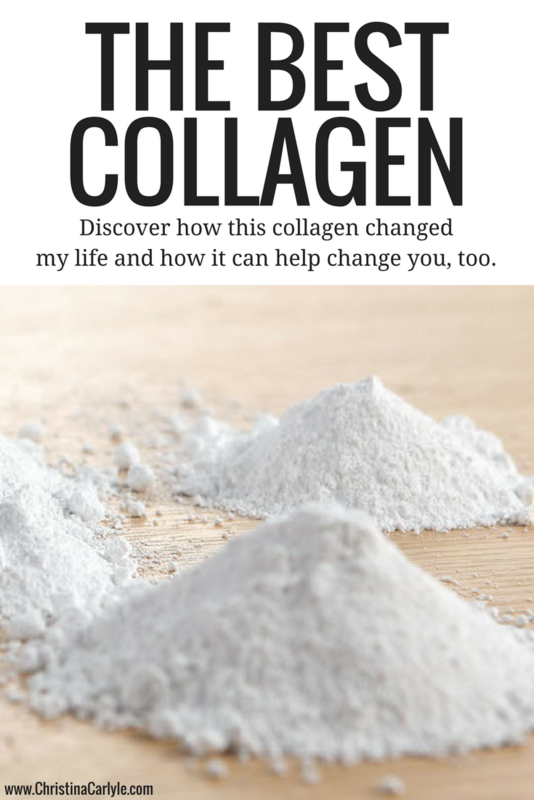 Collagen is the main structural protein found in your connective tissues and skin. You stop making collagen as you get older. This is also why you become more susceptible to joint pain as you get older. When you lose collagen, your skin loses elasticity, too. This is why people’s skin gets loose and ‘falls’ as you get older. This is also why cellulite gets worse as you age. Weakened collagen, makes cellulite more apparent because the skin becomes more thin, loose, and isn’t able to conceal the texture irregularities created by the superficial fat and fascia just below its surface. This is why you see collagen in so many beauty treatments. This is why collagen-stimulating procedures are so popular. This is why celebrities take collagen daily… so they can reduce/prevent aging and cellulite. 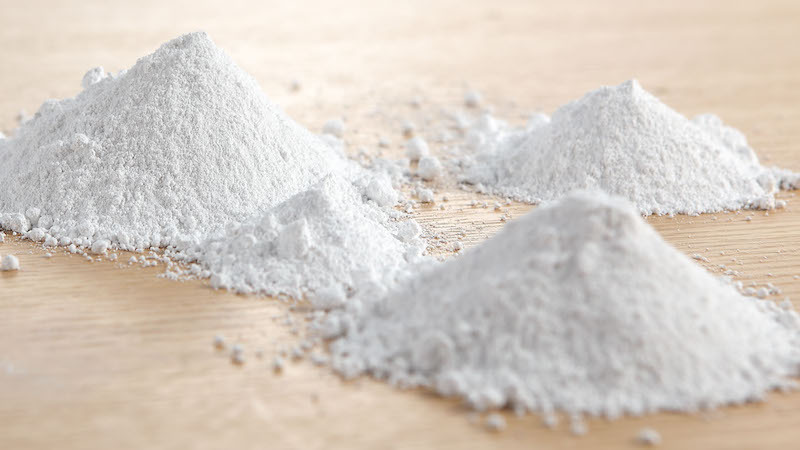 When you consume a high-quality collagen, you can help prevent collagen from breaking down. You can use collagen to rebuild and repair tissue/skin that has already broken down. 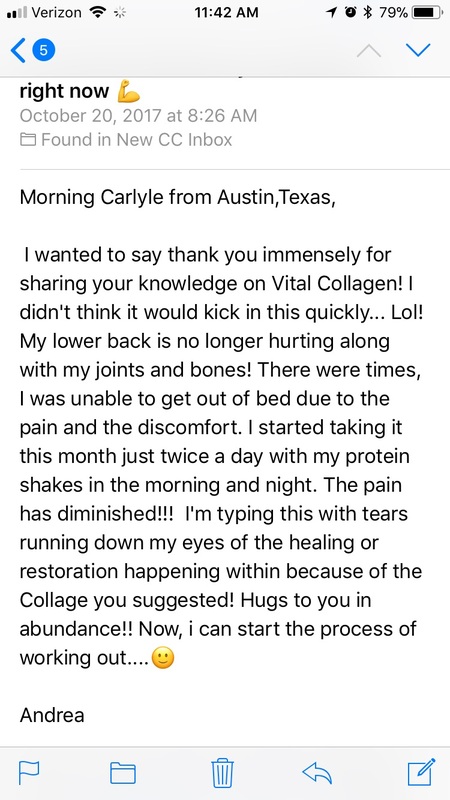 This is why I started triple – daily dosing (breakfast, lunch, and dinner) with collagen when my back started hurting… to help accelerate the healing process while I’m in therapy. I used to have some collagen once daily to help me recover from my workouts, stall the aging process, and minimize/prevent more cellulite. BUT when I started triple dosing with collagen, I’ve noticed a huge, undeniable change. My back pain became less intense. Now it only hurts when I bend/twist the wrong way. My left knee doesn’t hurt anymore. It always used to throb at night. My skin looks better. The fine lines around my eyes have faded a bit. My cellulite looks like it’s faded, too. And I’ve been exercising a lot less since the pain started. The only thing I’ve changed in the past month is that I’ve increased my collagen intake. I wish I would’ve started using more a long time ago. Which I why I’m talking about it today. I felt obligated to share it with you, too. I NEVER suggest products unless I know they work. I can honestly say this does. I typically only recommend products on a case-by-case, as needed basis. But I feel like everyone can benefit from this collagen. Click the pic to order yours. You’ll be glad you did. *UPDATE* (October 24, 2017) This is a screenshot from an email I got after recommending this collagen to my subscribers. This collagen is the BEST! These Collagen Peptides are sustainably-sourced from grass-fed, pasture-raised cows to ensure high quality. This collagen is quick and easy opposed to making bone broth. Other brands I’ve tried didn’t dissolve. They turned into gluey-goo. They also tasted weird. You can learn more about this collagen… and read the nearly 1800+, 5-star rated reviews by clicking here. This links to the exact collagen (bovine) I’m using… and you can click around to find another variety that may suit your personal preferences better. They have marine collagen and vegan options, as well. P.P.S. This post is not intended to diagnose, treat medical conditions, or replace medical advice. Hello Christina! How do you get past the taste and smell? It gives everything a funky taste and it doesn’t dissolve very well. Any ideas or suggestions? Also the few times I took it, it seemed to make my “leaky gut worse” and my joints ached and both improved after stopping it. Did you have any issues when first starting it that subsided after continued use? For me there isn’t a taste or smell to get past(??) It’s unflavored. I add mine to shakes, smoothies, and soups… and it dissolves fine. Are you adding it to ice water? That can make it take longer to dissolve. Collagen improves leaky gut and joint pain. Are you sure you have leaky gut? Are you eating/drinking things that cause leaky gut and inflammation?? This won’t work as well and heal leaky gut if you’re still eating/drinking things that cause it at the same time.